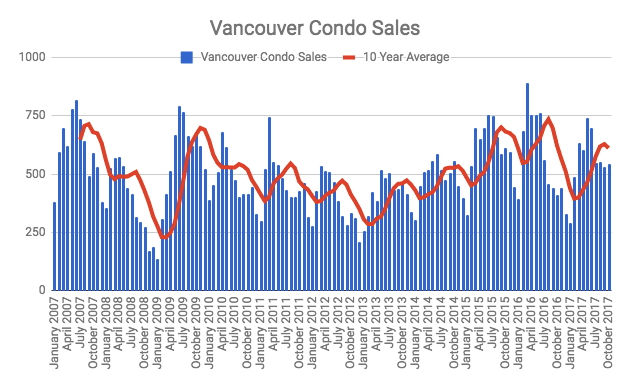 Vancouver condo sales increased by 33% on a year over year basis and were 14% above the 10 year average for the month of October. Much of the sales activity is shifting towards the East side of Vancouver as prices on the west side become out of reach for many. For further context, here’s how sales are looking month to month over the past decade. Including a 6 month rolling average, which highlights the drop after the foreign buyers tax last year and then rebounding in early 2017. 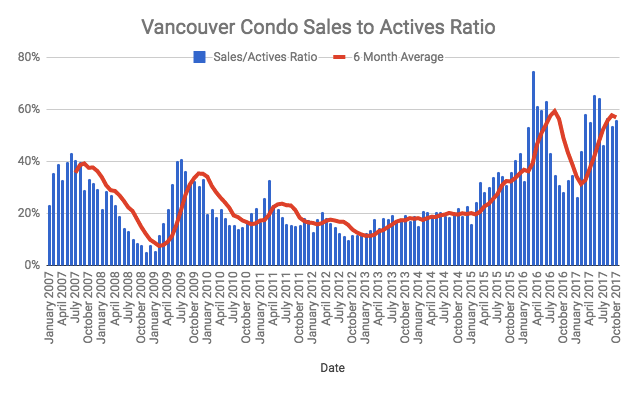 Overall Vancouver condo new listings are increasing. They increased by 13% across Vancouver on a year over year basis. This is obviously not enough to keep pace with sales and historic low inventory levels. 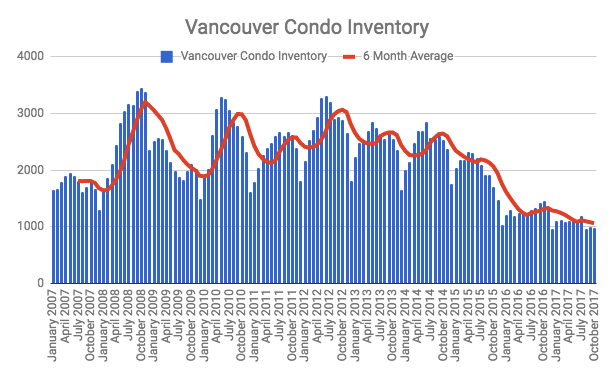 Vancouver condo new listings were 3% below the 10 year average for the month of October. Condo inventory plunged 33% year over year in October. There are currently 971 units for sale, this is the lowest total in recent history. This is a huge reason behind intense bidding wars. The sales to actives ratio in October was 56%, indicative of a hot sellers market. The average sales price increased to $906,650 a 17% increase on a year over year basis. The median sales price is showing a 28% increase, sitting at $748,500. The average price per square foot a new high of $1045 and continues to trend upwards. There seems to be little signs of price growth slowing. This is largely due to inventory levels continuing to inch lower despite new listings starting to grow. Multiple offers remain the normal. I suspect activity could slow in the coming winter months, and perhaps a new mortgage stress test will bring some sanity to the condo market.